155 Pickles Spices Gooseberries. Mrs. Matson 8 pounds gooseberries 4 lbs. sugar 1 pint vinegar 1 ounce ground cinnamon 1 ditto cloves Boil sugar, vinegar & gooseberries slowly 4 hours, stirring frequently. 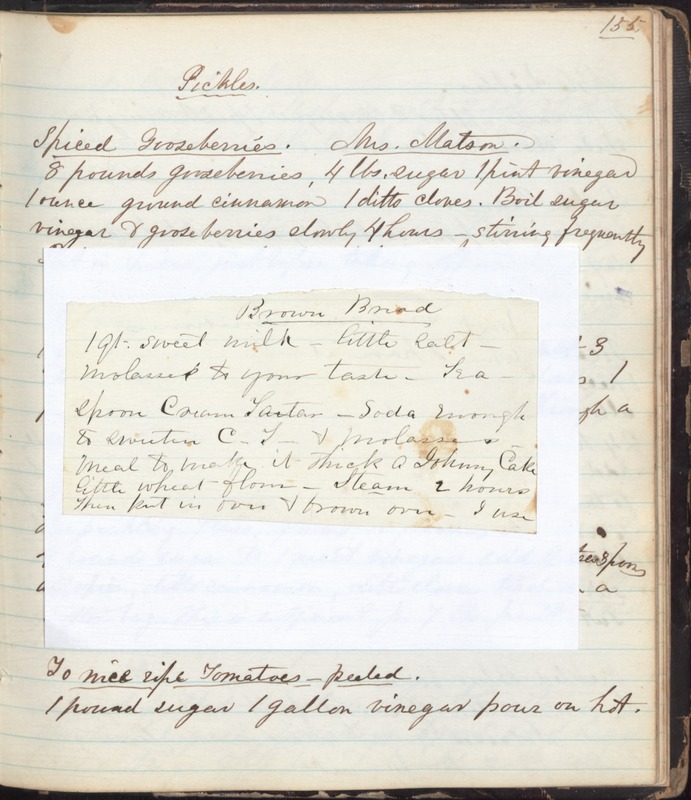 [recipe continued but blocked by recipe for Brown Bread] Brown Bread 1 qt. sweet milk little salt molasses to your taste teaspoon Cream Tartar soda enough to sweeten C. T. and molasses meal to make it thick a Johnny Cake little wheat flour Steam 2 hours. Then put it in oven & brown over. I use… To nice ripe Tomatoes, peeled. 1 pound sugar 1 gallon vinegar Pour on hot.